A few months ago I bought an original iPhone. It was listed as spares and repairs, and while it powered up, it did look in a sorry state. 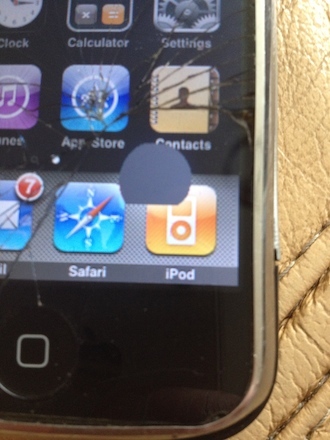 The screen was smashed, and the LCD had some large patches of grey pixel outage, although the screen worked fine. The power button didn’t work, but everything else worked on it. I bought it mainly because it was a 16 GB version, which are very hard to find in the UK. It was also listed as unlocked, but I am not entirely sure it is. Previous unlocked iPhones I have had will activate using any SIM card, whereas this will only activate using the original SIM provider – that’s O2 in the UK – but once activated will take any SIM, even if I restore the firmware on it. Very odd. My first mission was to repair the power button. I was hoping to put custom firmware whited00r on it at some point and would need a working power button to enter DFU mode. 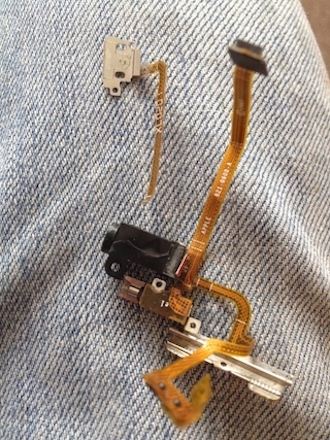 The power button, sleep button, volume buttons, and headphone jack are all connected on one flex cable. Once you take the silver back off, there is a cable connecting it to the logic board that can be disconnected gently. Looking at the cable, the flex running to the power button was broken off, so that answers why the power button didn’t work. A quick look online, and I found a new one for £5, and it arrived quickly. It isn’t the easiest item to fit – not too technical, just very fiddly due to its size. It took me 30 minutes to fit it and get everything back in the correct position. Then I came up against a problem. The power button was working, but there was an issue with audio. Pressing the volume keys it said headphones and no audio played. If I plugged in a set of headphones, audio came out of the iPhone speakers. It seemed confused. A bit of digging, and this is a common problem. There appears to be two headphone/power button flex cables, both identical, both will physically fit. The old cable is marked with Apple part number 821-0600-A; the new one is marked Apple part number 821-0449-09. This is the problem. You need to replace your cable with exactly the same part number. You can modify the wrong cable by bending a piece of copper on the headphone jack from one side to the other, but I fear this could end up breaking something, and then I would have no buttons working on the top half of the phone. A temporary solution – until I can source the correct part – is to cut off the jack plug to a pair of headphones and place it in the socket. This fools the phone into thinking there are headphones in there and therefore reverses the audio so you can use it as a phone. The down side to this is that you cannot use the headphone jack, but it is an easy work around. Shortly after purchasing the phone, the battery started showing charging problems. The phone would bleep to say it was charging, but if left for an hour or so, the battery wouldn’t be any further charged. This kept going until the battery died – then plugging it in it would show the “I am charging” symbol but once again, wouldn’t actually charge. I purchased a spare battery, but changing one in the first gen iPhone is no easy task. 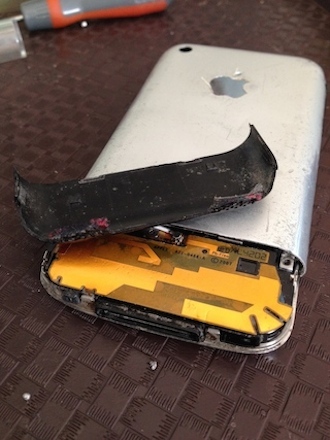 While most mobile phones have removable batteries, iPhones don’t. 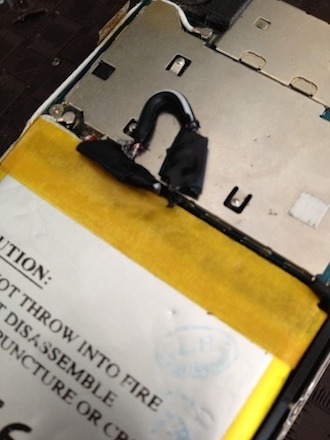 Newer iPhone batteries are simply connect to the logic board – a 5 minute job to replace. 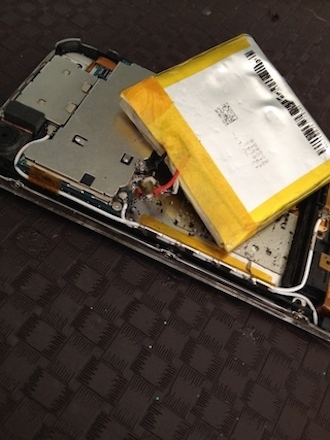 The original iPhone has its battery soldered to the logic board. It is also stuck down firmly with glue. This makes replacing one quite tricky. My soldering skills are not very good, but I thought I would attempt it. The first attempt didn’t go well. I decided to cut the wires from the old battery and join the new battery wires to it rather than soldering directly on the board. I read somewhere that it needed to be done in a certain order: red, white, then black. On switching the phone on, it would come on for a few seconds, the Apple logo would show, and then it would shut off. I unsoldered the battery and tried again. This made no difference; the same problem occurred. Had I soldered in the wrong place? Had I overheated the phone or battery? Were the solder joints touching each other? Or was the battery a dud? I really didn’t know, but I was now left with a dead iPhone. I removed the battery and – just out of curiosity – when plugged in with the battery removed, the phone did the same thing. This pointed towards either the phone was now faulty or the battery wasn’t connected properly. It was put in the drawer and left for a few weeks, until today when I was tempted to just throw it in the bin. Something stopped me, and I thought I would give in another go. Somehow between being put in the drawer and now, the black cable had gone, so I had to solder the one directly from the battery to the board. This time it worked. The phone booted up all the way, and I was sitting looking at the globe backdrop. Filled with excitement, I set about putting the phone back together and then faced a problem. The black cable was too short, meaning I couldn’t put the battery in place without breaking the connection. I decided to bridge it with a piece of cable. I soldered a 3 cm piece of cable to the battery and then soldered that to the logic board. This did the trick. I wrapped the solder joints as tightly as I could in insulating tape to keep the contacts safe and separate from each other, as all three cables would be squashed together. I carefully pressed the cables into place and pushed the battery tightly back in its place. The extended black cable sticks out the top, but it lays fairly flat and close to the phone body. I connected the power/headphone connector to the logic board and put the back casing on. The extra black cable made it a little tight, but it went on okay. I bought a new antenna cover a while back, as the old one was broken, so I popped this on at the same time. I would like to sort out the audio issues. Do I install the old cable and live with a broken power button? Remember, this is OS3, and assistive touch didn’t officially enter until iOS5 (which this phone can’t run), or do I try to source the correct cable? The screen is fully working, but it has some very bad pixel outages and the glass is smashed. 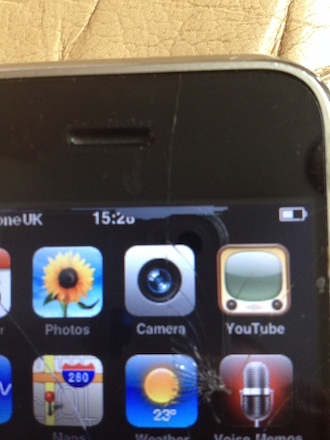 This really doesn’t bother me – it is only a spare phone, but at some point I might attempt to replace this too. 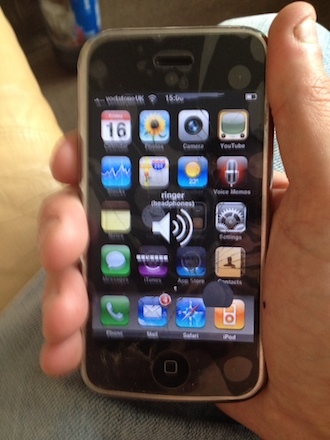 I am very happy to have what I thought was a completely dead iPhone be up and running again. It might be old. It might be beat up. 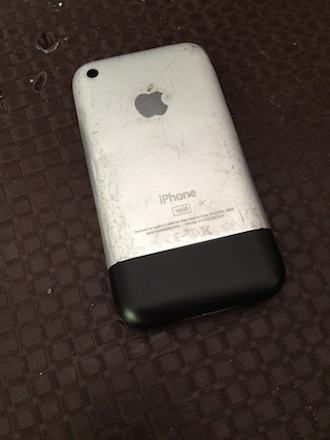 To most it might not be worth the effort or any money spent on it, but I hate to see anything thrown out and have a fondness for the original iPhone. Keep a look out for part 2 in the near future.